Buying a pro range 5 years ago was easy. You had a choice of which burners were better for power and simmer. Then Wolf added twin convection. Jenn-Air and Capital added more powerful burners. Thermador really changed the pro range by adding steam in the secondary oven as well as a warming drawer below. Miele introduced their pro with a speed oven, a steam assist and an intuitive control panel. So a comparison between the two most advanced professional range seems like a good idea, since it happens daily on the sales floor. Miele offers 3 models of 48” wide ranges with 2 burners at 12,500 BTU’s, and the rest are 19,500 BTU burners. The HR 1954 DF is equipped with a rare eight dual stacked burner configuration, and is priced at $12,499. The HR 1955 DF GR and the HR 1956 DF GD are both priced at $12,999, and are available with a 15k BTU powerful 1,000 degree grill and griddle respectively. Miele features dual stacked burners with TrueSimmer for a continuous power control from high to a low even simmer. Another plus is ComfortClean dishwasher safe enameled cast iron grates with anti twist guards. The racks can also be left in the oven cavity during a self-cleaning cycle. The oven is twin convection for more even cooking for 21 different cooking modes. The wireless probe can be placed anywhere and will signal the oven to shut off at the appropriate internal temperature. However, the real advantage to Miele is technology and intuitive controls. Their MasterChef and MasterChef Plus modes are simple to operate. Just input the type of food, weight and doneness, the oven will automatically program the right time and temperature. Most companies have added this type of technology to their wall ovens, but Miele is the first to deploy in a pro range. The MasterChef Plus is a program for 16 different types of bread (yes 16). Miele, unlike Thermador, is not a steam oven per se, but a steam assist oven. You can choose up to three bursts of steam for that crispy texture in bread or slightly hardened top of lasagna for example. You cannot cook as a steam oven. The secondary oven is speed, which is a current term for the old convection and microwave. You can cook as a regular oven, as a microwave or save time using a combination setting. Sharp has been manufacturing convection microwaves since the late 1980s, and they work well. Below the oven is a warming drawer to keep food warm for up to three hours or refresh leftovers. Thermador offers a distinctive model in its Pro Grand line with burners of a max 18k BTU’s and a power burner with 22k BTU’s. It is one of the most powerful ranges on the market, but is also the lowest simmer at 100 BTU. The star shaped burners spread the heat more evenly than the round burners offered by every other manufacturer. The oven configuration is one large single convection oven. Steam is the secondary oven. Unlike Miele, it is a full steam oven, not just an assist. You can cook anything better in a steam oven, because it refreshes and does not bake out the nutrients. It is great for meats, brownies and leftovers. The warming drawer is below the steam oven. This is tough, because they almost seem like two different ranges. It depends on your preference. I like the top of the Thermador with significantly better output and simmer. Miele excels at technology and will virtually eliminate any guesswork in the oven with a touch of a button. From that perspective, Miele is better. The ovens are an interesting comparison. You have a steam assist for Miele in a twin convection oven for baking bread and finishing different types of food. The microwave convection is a big plus as well. Cooking in a true steam oven will produce the best product. 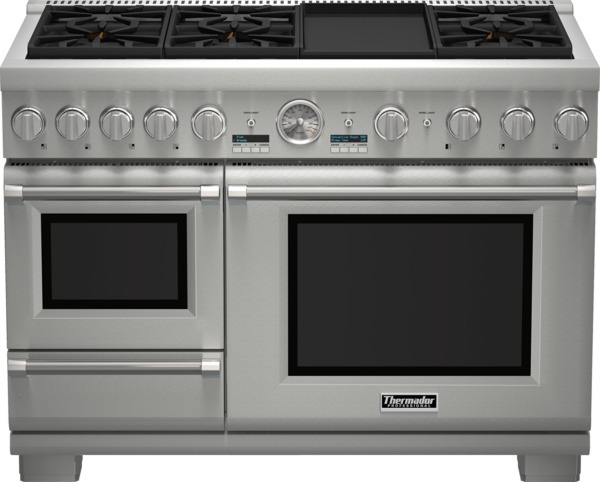 However Thermador's large oven is just a single convection, not twin and devoid of any type of technology. So which is better? It depends (once again) on how you use the range. The top? The oven? Would you use the steam oven? Do you have a place in the kitchen for a microwave? Your answers will determine the better range for you. According to our internal service figures, Thermador is the most reliable luxury brand EXCEPT for Miele at less than 3% service within the first year. Miele, however, has never manufactured a professional range before 2015, so we will see if it is as reliable as their dishwashers. Download the Yale Professional Range Buying Guide with features, specs and inside tips to all the brands like Wolf, Miele, Thermador, Viking, GE Monogram, Dacor and more. Over 90,000 people have read a Yale Guide.